It is official. Consumers in Colorado appear to be tapped out. This comes at a time when the recovery is now tied for the second-longest economic expansion in American history. The stock market is near an all-time high, unemployment is the lowest in two decades, consumer confidence is beyond euphoric, and Trump tax cuts are stoking the best earnings quarter since 2011 — unleashing a record amount of corporate stock buybacks. While a real economic recovery could be plausible this late in the business cycle, the unevenness of the recovery has left many residents in Colorado without a paddle. Accelerating real estate and rent prices across Colorado are squeezing residents out of their homes at an alarming pace. According to ABC Denver 7, Denver metro area’s skyrocketing cost of living, stagnate wage growth, and lack of affordable real estate has fueled an enormous housing crisis — overwhelming the state’s eviction courts. Colorado Center on Law and Policy (CCLP), which has spent decades advocating for tenant rights, warns that an eviction crisis is underway in the Denver region. ABC Denver 7 said, “27 percent of all civil cases filed in Colorado in 2017 were evictions, which represents 45,000 cases.” In Denver alone, eviction cases accounted for nearly 18 percent (8,000 eviction cases) of all evictions across the state. Arapahoe County, the third-most populated county outside of Denver, experienced the most significant number of eviction cases at nearly 22 percent (10,000 eviction cases) in 2017. Jack Regenbogen, attorney and policy advocate for the Colorado center on Law and Policy, told ABC Denver 7 that most tenants are underrepresented in eviction court cases. In return, this has led to more evictions forcing tenants out onto the streets. He says about 90 percent of landlords are represented by legal counsel during an eviction process, but less than one percent of tenants have legal assistance. “Traditionally, Colorado has been a very friendly state towards landlords. We really need our policymakers to begin investing meaningful resources to address this issue,” said adds. 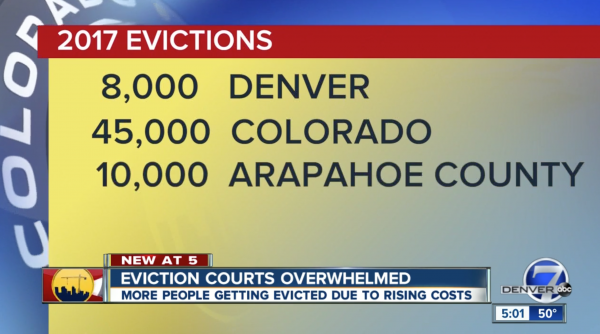 ABC Denver 7 indicates that more than 50 percent of Coloradans are renting, and as court dockets continue to expand with evictions in 2018, the crisis is far from over. Danyliw, further said housing activity remains stable, but increasing interest rates could have an eventual impact on the real estate market. Evidence continues to build that housing affordability is getting worse, particularly for everyday Americans. Colorado is the latest example of consumers physically tapping out, as they can no longer afford soaring real estate/rent prices - which is now overwhelming state courts in Denver.